These cute socks are the perfect addition to your sock collection! Brilliant as a present for a friend or simply to treat yourself, the fun design is sure to leave you smiling. Each set comprises of three designs. A West Highland Terrier sits below the blue cuff of a pink sock, above a line of love hearts. Another features a pattern of Dachshunds and dog bones on a blue background. The final design, a navy sock, features a pink argyle pattern finished with a West Highland Terrier below the cuff. Each is designed with a matching toe and cuff for a coordinated look. All socks benefit from padded soles for comfort and bamboo for its anti-bacterial benefits. A bright and cheerful sock. 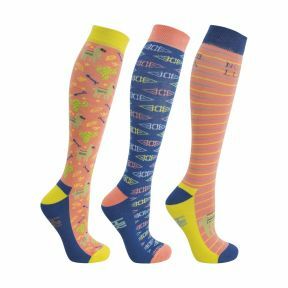 These pack of socks feature 3 different fabulous flamingo designs. The first sock is designed with the signature flamingo and pineapple pattern with a pretty yellow cuff, heel and toe. 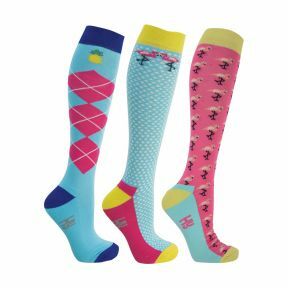 The second sock, an argyle design which features a pineapple just below the cuff, and the third sock is a funky spotted white and teal design with flamingos around the cuff. All socks benefitted from padded soles for comfort and bamboo for anti-bacterial properties. HyFASHION Sunflower Socks Pack of 3 A perfect new sock with these beautiful bright sunflowers! 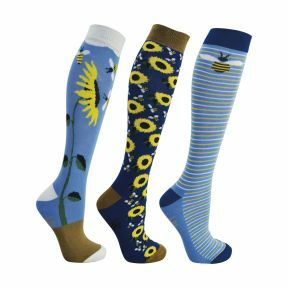 The first sock features sunflowers and bees with a bright blue background and brown toe making the perfect sunflower picture. The second sock has a bee and sunflower pattern with a dark blue background and contrasting brown cuff, heel and toe. The third sock features a bee on either side with a slim stripe pattern. All socks benefitted from padded soles for comfort and bamboo for anti-bacterial properties. Be the envy of all you friends with these magical unicorn socks. Designed with breathable bamboo fabric which wicks away moisture and has antibacterial properties to keep little feet hygienic and fresh. Sold in a set of 3, each pair features a different design in pink and lilac with a dash of green. One pair features coloured stripes and rainbow feature, another is designed in argyle checks, whilst the final pair features the cutest unicorn head on the top of the foot. All 3 designs feature a matching toe, heel and cuff. 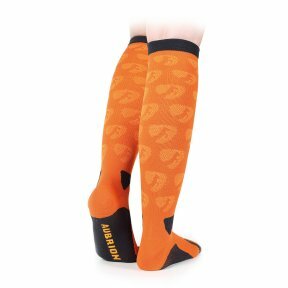 Hy Newmarket Horse Print Socks Pack of 3 The perfect gift for a horse lover! 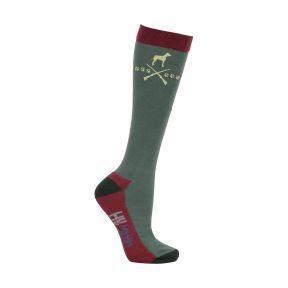 These socks feature a smart equestrian design on each style of sock. The first features a horse in colours matching the toe and cuff, standing above a row of horse shoes. Another sock is designed with a pattern of horses and bows against a coral background. The final sock has a lemon yellow argyle pattern, finished with a horse. Each sock has a matching toe and cuff for a coordinated look and comes with padded soles for comfort and bamboo for its anti-bacterial benefits. HyFASHION Llama Socks Pack of 3 A funky new set of socks that are the perfect addition to your collection! 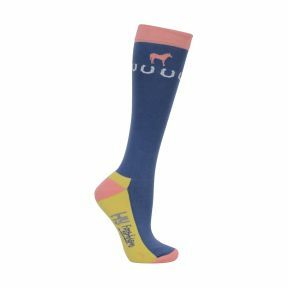 The HyFASHION Llama Socks feature the contrasting coral, blue and sunshine yellow colours complementing the different patterns on each sock. 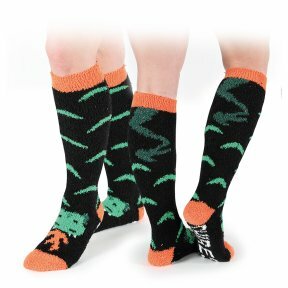 The first sock features a groovy Llama and cacti pattern with contrasting soles, cuffs and toes flattering the look of the sock. The second sock features a multiple triangular design with the signature sock colours. The final socks feature a No prob Llama legend and the llama split into two across the top of the foot. 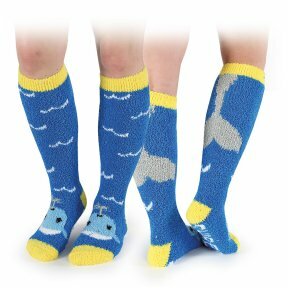 A funky set of socks, all of which benefit from padded soles for comfort and bamboo for anti-bacterial properties. Get the country look with our HyFASHION Fox and Hound socks! The traditional look comes in three designs, each featuring a different aspect of country life. Starting the set off is a shooting theme with a hound standing proudly above a cross made of guns, finished with fox paw prints. The second sock features a decorative design of hounds, foxes and hunting horn. This collection is finished with a pheasant sat above the argyle pattern with contrast sole, heel and toe - all with padded soles for comfort and bamboo for its anti-bacterial benefits. Featuring fun and colourful designs, these fluffy socks trap air to keep feet cosy and toasty warm. Perfect for wearing inside our country boots or for relaxing in after a hard days horse riding. Light compression around the legs to aid muscle recovery after exercise. Zonal knit patterns assist with support, moisture management and cushioning for energised feet and legs.